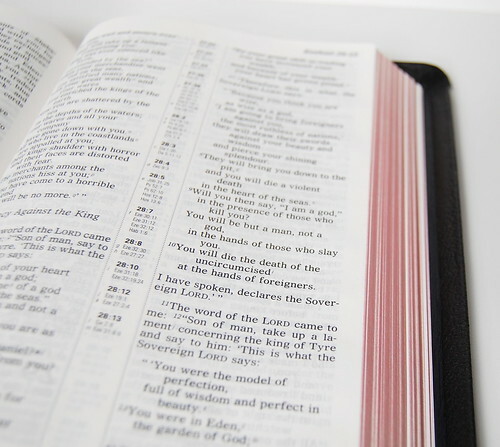 Looking for a good deal on a great Bible? R. L. Allan's is offering "slightly imperfect" copies of the Bold Print Reference NIV bound in black Highland goatskin for just £50. Supplies are limited, so if you like what you see, you'll want to take advantage of the opportunity now. Ready to take a look? This edition is everything you would expect from Allan's: soft and supple, incredibly limp, a pleasure to hold in the hand. The proportions are very similar to the famous Allan's ESV, just a little thicker, a hair taller, and perhaps an ounce or two heavier. The text block comes from Hodder & Stoughton in the UK. And the slight imperfection? The outside margins are 3mm tighter than they should be. And let's talk about those proportions. They're beautiful. This is the first time I've seen the Bold Print Reference layout, and I really like it. The type is relatively large (at least 10 pt, possibly more). It is dark and crisp, too. 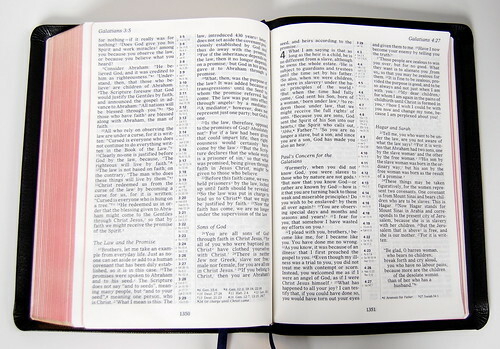 Though there is some bleed-through -- I can't think of a Bible that doesn't have some -- the pages are sufficiently opaque that it doesn't distract. If you click on the image above and view it in the original size at Flickr, you can judge for yourself. The size and darkness of the type make this a very readable layout. If you're one of those people who's often frustrated by the small type size and light print found in so many Bibles, you'll love this one. I'm particularly impressed with the way the center column references are organized. They're separated from the text columns by dotted lines on either side, with chapter and verse in boldface and the notes underneath. Textual notes, when they occur, are found at the bottom of the right-hand column on the relevant page. 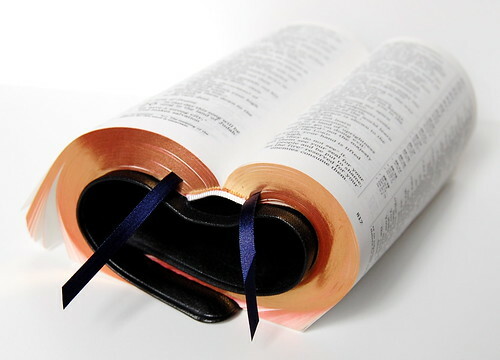 The Bold Print Reference NIV performs in every respect like the familiar Allan's ESV. The spine is sewn, naturally, and it opens flat. 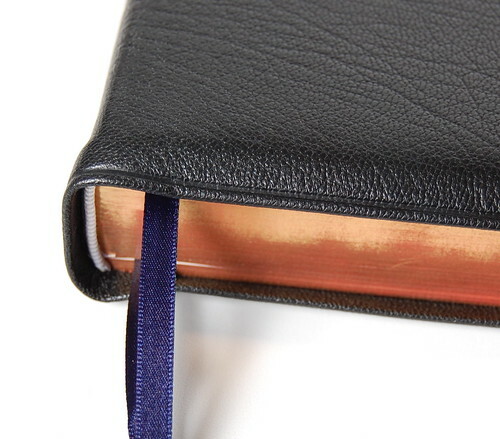 The cover features a full yapp edge, which means it overlaps the page and curls around it in a protective clamshell. There are two ribbons -- blue -- and the page edges have the usual art-gilt treatment, which appears red from some angles and gold from others. The Highland goatskin cover is thin and flexible, with an attractive, subtly veined grain. Taking a tape measure to the outside, I come up with the following dimensions. The spine is about 1.5 inches thick, so there's no mistaking it for a thinline. Instead, it fills the hand nicely. The outer dimensions of the cover run about 9 x 6.25, while the page itself is 8.25 x 5.75, give or take. When the spine is supported, the covers angle gracefully down, as you can see in the photo above. 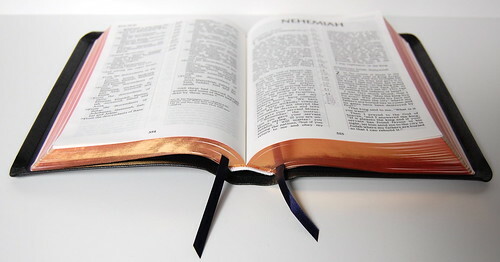 To me, this is ideal, because a pliable cover makes a Bible easy to handle while reading or teaching. 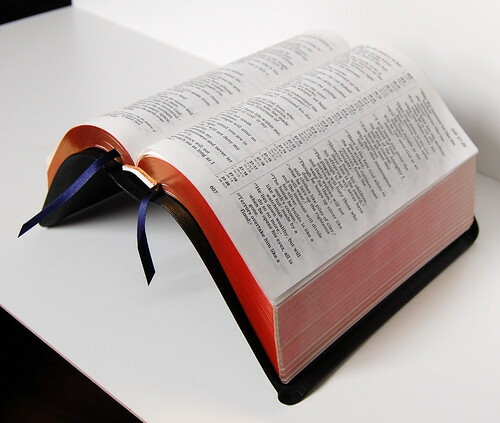 Some people find this too flexible, feeling the Bible might slip away from them, but once you get used to the increased flexibility, I find it hard to live without. 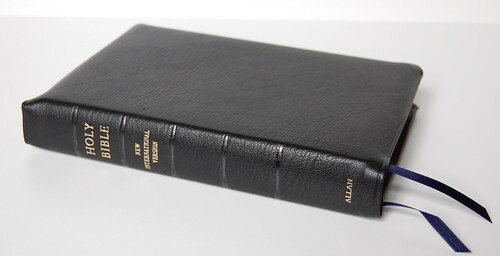 If you're looking for a readable, elegantly designed NIV with a spectacular goatskin binding, these slightly imperfect editions are a great bargain. Regularly listed for £65, the £50 price represents a savings of about $30 for US purchasers, bringing the price somewhere in the region of $100. If you read the NIV, or you're just looking for an Allan's edition at a great price, the Bold Print Reference is a good deal ... while it lasts!